The measuring hardware consists of the system ISES (Internet School Experimental System) to which the modules thermometer, pressure measuring and light sensor units are connected. As the software for the remote experiment and server-client connection the ISES WEB Control kit software is used. 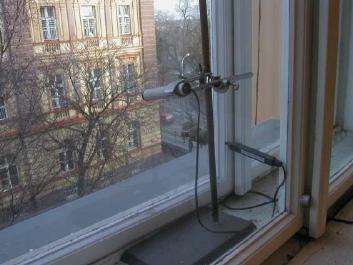 The thermometer is located 20 cm from an outer window pane (Fig. 2), the barometer unit is located inside the laboratory and the photometer is directed horizontally to the sky. The thermometer and photometer are directed to the East. The photometer is not a heliograph (in that sense that the device does not collect the sunshine from the whole hemisphere) and the thermometer is partially protected from the direct sun.